The news as reported by Der Lecha Caunty Patriot that fifth day of November in 1862 was likely worrisome, but not tragic for those who knew Mary Fink. Keeping the home fires burning in the Lehigh Valley had not been easy for the mother of three young children while her husband was away in the Deep South, fighting to preserve America’s Union. While others from her husband’s regiment were reported to have been killed in action during the Battle of Pocotaligo, South Carolina, the editors of Allentown’s German language newspaper had stated that her husband had only been wounded. Surely, there was reason for hope. And then the official word came. Corporal Aaron Fink, a native of Salisbury Township who had been born on 4 November 1823 to Solomon and Mary Elizabeth Fink, was gone. Shot below the knee(s) in one or both legs during the heavy fighting at the Frampton Plantation while the 47th Regiment, Pennsylvania Volunteer Infantry and other Union troops were attempting to destroy the railroad infrastructure in and around Pocotaligo, South Carolina, Corporal Fink was stabilized enough to be transported behind the Union’s lines for more care before being shipped off to the Union Army’s General Hospital at Hilton Head, South Carolina. But his wounds were simply too grievous. He died at that hospital in Hilton Head on 5 November 1862 – the very same day on which the newspaper had first reported that he had only been wounded. The result could only have been shock, followed by fear. The life she had known during a nearly 17 year marriage with her shoemaker husband was over, and she was now a widow with three small children who would be hungry and homeless if she dithered about how to support her household. Allentown undertaker Paul Balliet brings the bodies of 47th Pennsylvania Volunteers Aaron Fink, George Junker, Henry A. Blumer, and Henry Zeppenfeld home to the Lehigh Valley (Der Lecha Caunty Patriot, 3 December 1862, public domain). 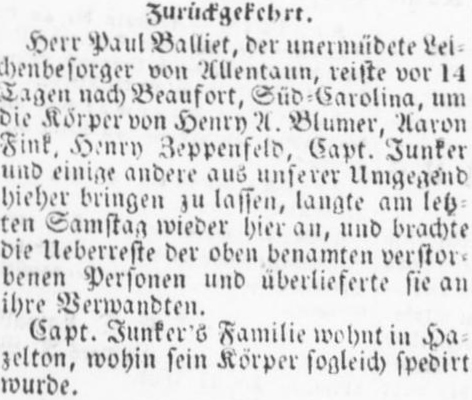 Before that terrible month was over, Paul Balliet, a respected undertaker from Allentown, traveled to Beaufort, South Carolina, exhumed her husband’s remains and those of three other members of the 47th Pennsylvania Volunteers (Captain George Junker, Henry A. Blumer, and Henry Zeppenfeld), and brought the bodies back to the Lehigh Valley to enable relatives and friends to give each soldier a dignified funeral and burial on home soil. Corporal Aaron Fink was laid to rest at the Union-West End Cemetery in Allentown sometime in late November or early December 1862. Following the reburial of her husband, Mary (Kemmerer) Fink was represented by Thomas B. Metzger of Allentown during a series of legal proceedings which occupied her time for several years. Apparently illiterate or functionally so, because she was a speaker only of German or “Pennsylvania Dutch” who was unable to communicate effectively in English (as evidenced by the “X” marks she made on related paperwork instead of a formal signature), she renounced her “right to act as Administratrix of [her] deceased husband’s estate,” and asked the court to appoint Metzger as “Administrator of said estate.” In a nutshell, she signed over her Power of Attorney to Metzger, who then served as the executor of Aaron Fink’s estate and its accountant, as well as her advisor when applying for a U.S. Civil War Widow’s and Orphans’ Pension. received wounds in the legs below the knees, on the twenty second day of October, last past, at the battle of Pocotaligo, in South Carolina, in consequence of which said wounds, he died on the fifth day of November AD. 1862. She further declares that she was married to the said Aaron Fink on the fourth day of May [her marriage certificate stated 5 May], in the year 1845…. Then, on 28 February 1863, according to Aaron Fink’s Lehigh County estate probate file, Thomas Metzger confirmed for the courts that he had retained the services of two appraisers, John Hanaman and Jacob S. Dillinger, to “well and truly and without prejudice or partiality value and appraise the goods, chattel and credits which were of the said Aaron Fink, deceased, and in all aspects perform their duties as appraisers to the best of their skill and judgment.” The appraisers determined the availability of $41.75 in the Finks’ financial account for transfer, and confirmed an additional $2.12 in personal property items, including earthenware, a wash stand, saw, and shovel. In addition, there were notes associated with Fink acquaintances: Lafayette Bartholomew ($15.48 with $1.86 paid on 22 January 1859 and $3.80 in interest accrued since that time) and Charles L. Fink ($51.17, dated 1 February 1861 with no additional notations of payment or interest). Also on that same day (28 February 1863), Mary Fink elected to keep a number of personal property items “to the value of three hundred dollars,” asking “that they may be apprised and set apart according to the law”: beds and bedding (2) bureau, carpets in kitchen and on stairs (plus 20 additional yards of carpet), cane seat chairs (6) and other chairs (7), chest, clock, cradle, earthenware, lamp, looking glasses (2), kitchen utensils, rocking chair, saw, shovel, stand, sink, stone with pipe and kettle, stair rods, table and cloth, trunk, tubs, and wash stand. The appraisers confirmed that the “said Mary Fink widow of said Aaron Fink elects to retain all of her personal effects, with the exception of the notes” named in their appraisal. On 2 March 1863, Metzger and the appraisers filed a more comprehensive appraisal of the estate which appears to indicate that Mary Fink experienced financial hardship after her husband’s death, resulting at least partially from debts the family had incurred but not yet paid to creditors. In response, Metzger arranged the sale of the Fink’s house and lot on Eighth Street in Allentown. the widow of Aaron Fink, deceased, who was a Corporal in Company “B” of the 47th Regiment Penna. Vols. That she was the holder of a Pension Certificate No. [no number written]. That in the original application ‘George’ was stated to be [illegible word] of the children after, deceased, that in application for the increased pension the name of ‘George’ was omitted as he was then over the age of sixteen years having been born April 21, 1850. That ‘Alfer Dewees’ mentioned in the second application for the increased pension is the correct name of her child and is the same child as ‘Alpheus’ mentioned in the first application. That ‘Mary Malosina’ mentioned in the second application for the increase in pension is the correct name of the other child of this deponent [illegible word] her said deceased [word heavily crossed out and illegible] and is the same that is mentioned as Mary in the first application. That the person who wrote the first application stated the names of said children erroneously…. This 1867 affidavit also noted that she was still unmarried and residing in Allentown nearly five years after her husband’s Civil War death. Other records confirm that she had initially been awarded a widow’s pension of $8 per month. On 19 October 1869, Mary (Kemmerer) Fink remarrried at the Moravian Church in the Borough of Emaus, Lehigh County, Pennsylvania. Her second husband was Conrad Bornman. Born in the village of Weilar, Saxony, Germany on 30 July 1827, he was a son of Christian Bornman (alternate spelling: Bornmann) and Elizabeth Hosfeld. As a consequence of this second marriage, Mary Fink Bornman was required by federal regulations to forego the income she had been receiving from her first husband’s Civil War pension. Several months later, on 9 March 1870, George Heft was declared as Guardian of Corporal Aaron Fink’s minor children by Jacob S. Dillinger, Prothonotary of the Court of Common Pleas, Lehigh County. Interestingly, Dillinger had been one of the two men involved in the appraisal of Aaron Fink’s estate. Additionally, the spellings of the Fink children’s names (Alpheus and Mary Fink) which George Heft utilized on paperwork he submitted to the courts regarding his guardianship (and to restart the federal government’s pension payments to the Fink children) were the same as the spellings on Mary Fink’s initial widow and orphans’ pension application. George Heft and the Fink children were subsequently awarded an orphans’ pension of $8 per month, plus an additional $4 per month ($2 per child). By the time of the 1870 federal census on 7 July, Mary Fink Bornman was residing with her second husband, Conrad, at their Emaus home, along with Mary Malosina Fink, her eight-year-old daughter from her first marriage to Corporal Aaron Fink. The Fink sons, however, are not shown as living with their mother at this point, signaling that they were either residing with their guardian, George Heft, or had possibly been enrolled at one of Pennsylvania’s schools for children of deceased Pennsylvania Civil War veterans. Also residing at the Bornman home in Emaus in 1870 were Conrad Bornman’s children, John (born in Saxony, Germany sometime around 1863) and Fredericka (aged 5), and 79-year-old Susan Bear. Conrad Bornman supported his newly blended family on the wages of a barber. 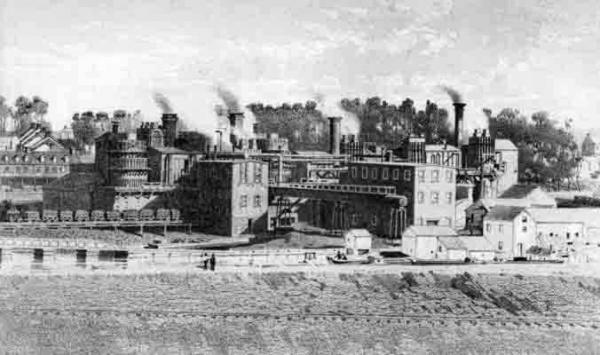 In 1880, Mary and Conrad Bornman resided in Emaus, Lehigh County, Pennsylvania with 17-year-old John Bornman, Conrad’s son from his first marriage. Both father and son were employed as barbers. That same year, Mary’s son, A. D. Fink, was residing as an unmarried boarder in Jewell County, Kansas, where he was employed as a harness maker. In 1887, he wed New York native, Lucy Jane James (1862-1930). They welcomed the births in quick succession of sons Harry J. Fink (born in Kansas in September 1888) and Raymond D. Fink (born on 27 February 1889 in Jewell City, Kansas). Three years later, in 1892, A. D. Fink paid a return visit to his home state. Serving as the delegate from Kansas to the Patriotic Order of Sons of America, he attended the P. O. S. of A. Convention in Lebanon, Pennsylvania that September. Two months later, he and his wife, Lucy, greeted the Kansas birth of their daughter, Mary E. Fink. Their youngest child, George Aaron Fink, was born in Kansas in August 1895. In 1900, Mary and Conrad Bornman were still residing in Emaus, Pennsylvania, where Conrad worked as a barber. Meanwhile, Mary’s son, A. D. Fink continued to nurture his growing lumber business and family. Residing at his home in Buffalo, Jewell County, Kansas with him at this time were his wife, Lucy, and their children: Harry (aged 12), Raymond (aged 11), Mary (aged 7), and George Aaron Fink (aged 4). More than a half century after she was widowed by her Civil War soldier husband, Maria Anna (Kemmerer) Fink Bornman became a widow for the second time when her husband, Conrad Bornman passed away on 24 January 1909. He had been diagnosed with “stomach trouble” and dropsy before suffering a stroke. Funeral services were held at the Bornman home and at the Moravian Church in Emaus, where he and Mary had married. The Bible text used for his service was Hebrews 13:14: “For here have we no continuing city, but we seek one to come.” He was then laid to rest at the cemetery of that church on 29 January. Mr. and Mrs. A. D. Fink and son Raymond of Formosa [sic], Kansas, are visiting Mrs. Conrad Borneman of Railroad St. at present. Two years later, Mary died in Emaus, Lehigh County, Pennsylvania on 28 August 1913. Funeral services were conducted both at her home and at the Moravian Church in Emaus, where she married her second husband. On 2 September 1913, she was laid to rest at the Moravian Cemetery where her second husband was interred. In her final will, which was filed in 1903, Mary Fink Bornman appointed Henry Bornman, the son of her second husband and a resident of Alburtis, Pennsylvania, as her executor. She directed that her estate be “equally divided, share and share alike, among my children, and the children of my husband Conrad.” She also, once again, marked her legal paperwork with an “X” in lieu of her signature. This time, appraisers valued the personal property of Mary and her deceased second husband at substantially more than what she had had with her first. Included in the $3,193.35 initially appraised for personal items were five rockers, two arm chairs and more than a dozen other types of chairs, a bed stead, five benches, two bureaus, carpets, two clocks, three mirrors, jars and a jug, an iron kettle, queensware and cooking utensils, quilts and sheets, a secretary, several sinks, table linens and two tables, tubs, and one wheel barrow. Additionally, her second husband had left her with real estate valued at $2,500 – with additional funds coming to the estate via: the rental income from two tenants of $112; interest in the amount of $156.75 paid on notes and mortgages by her sons, George and A. D. Fink, and others; $13.50 in interest paid by Macungie Borough and Dery Silk Mill bonds; and $224.40 from the sale of two tracts of land and household goods. Minus payments by the executor for Mary Fink Bornman’s funeral and burial, appraisal of her personal property and probate of her estate, taxes, etc., which added up to $246.64, her heirs split just over $5,000. What Ultimately Happened to Corporal Aaron Fink’s Surviving Children? At least two of the three children of Corporal Aaron Fink went on to marry and live long, full lives. His only daughter, Mary Malosino Fink, wed Emaus fireman Owen Schneck. Aaron Fink’s third son, A. D. Fink, relocated to Kansas and became a successful merchant. On 20 and 21 July 1916, The Allentown Democrat and The Allentown Leader reported that A. D. Fink had arrived in Pennsylvania from Formoso, Kansas for the funeral of his brother-in-law, Owen Schneck, and for a visit with his sister, Mrs. Owen Schneck. Two decades later, the 9 July 1936 edition of The Belleville (Kansas) Telescope reported that A. D. Fink’s store in Formoso was destroyed when the bank building in which it was located burned down. Meanwhile, sometime after the passing of her husband, Owen Schneck, Mary Malosino (Fink) Schneck apparently remarried, taking the surname of Becker, according to her Pennsylvania death certificate. Suffering from heart disease, she passed away in Allentown, Lehigh County, Pennsylvania on 2 September 1943. A. D. Fink died at the home of his daughter, Mrs. Mamie Jones on Thursday. He has made his home in Clyde since his wife died in 1930. Formerly Mr. Fink lived in Formoso. Graveside services were held at the Wallace cemetery east of Jewell on Saturday [14 December 1946]. 1. Aaron and Andrew Fink, in Gesellschafts – Auflösung, in Der Lecha Caunty Patriot. Allentown: 6 March 1848. 2. A. D. Fink (P.O.S. of A. delegate news), in P.O.S. of A. Convention: First Day’s Proceedings of This Order of Patriotic Citizens, in Lebanon Daily News. Lebanon: 21 September 1892. 3. A. D. Fink (obituary), in The Belleville (Kansas) Telescope. Belleville and Formoso: 12 December 1946. 4. Bates, Samuel P. History of Pennsylvania Volunteers, 1861-5. Harrisburg: Pennsylvania State Archives. 5. Bornman, Mrs. Maria Anna and Conrad Bornmann, in Funeral Ledgers, in Emmaus Moravian Church Records, in Historic Pennsylvania Church and Town Records (Reel: 539). Philadelphia: Historical Society of Pennsylvania. 6. Bornman, Mary A., in Old Moravian Cemetery burial records, in Historic Pennsylvania Church and Town Records (Reel: 562). Philadelphia: Historical Society of Pennsylvania. 7. Fink, Aaron (Veterans’ Grave Registration Record), in Civil War Grave Registrations Collection, Whitehall Township Public Library, Lehigh County, Pennsylvania. Harrisburg: State Library of Pennsylvania. 8. Fink, Aaron, in Civil War Veterans’ Card File. Harrisburg: Pennsylvania State Archives. 9. Fink, Aaron, Mary Fink and Mary A. Bornman, in Probate Records, 1863. Allentown: Lehigh County Register of Wills. 10. Fink, Aaron, in Registers of Deaths of Volunteers, U.S. Adjutant General’s Office. Washington, D.C.: U.S. National Archives and Records Administration: 1861-1865. 11. Fink, Aaron and Mary (Kemmerer) Fink, in U.S. Civil War Widows’ Pension Files. Washington, D.C.: U.S. National Archives. 12. Fink Family Birth, Marriage and Burial Records (various churches in Lehigh County, etc. ), in Historic Pennsylvania Church and Town Records). Philadelphia: Historical Society of Pennsylvania. 13. Fink Family Death Certificates (Mary M. Becker, George S. Fink). Harrisburg: Commonwealth of Pennsylvania, Department of Health, Bureau of Vital Statistics. 14. Fink Family News, in Personals, in The Allentown Democrat. Allentown: 29 June 1911. 15. Schmidt, Lewis. A Civil War History of the 47th Regiment of Pennsylvania Veteran Volunteers. Allentown: Self-published, 1986. 16. U.S. Census. Washington, D.C. and Pennsylvania: 1840, 1850, 1860, 1870, 1880, 1900, 1910, 1920, 1930, 1940. 17. Zurückgefehrt, in Der Lecha Caunty Patriot. Allentown: 3 December 1862.